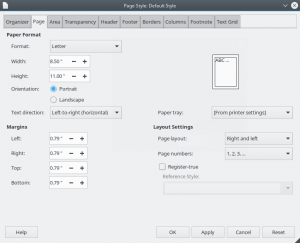 Margins specify the amount of space to leave between the edges of the page and the document text. You can define it for the left/inner, right/outer, top and bottom side individually. 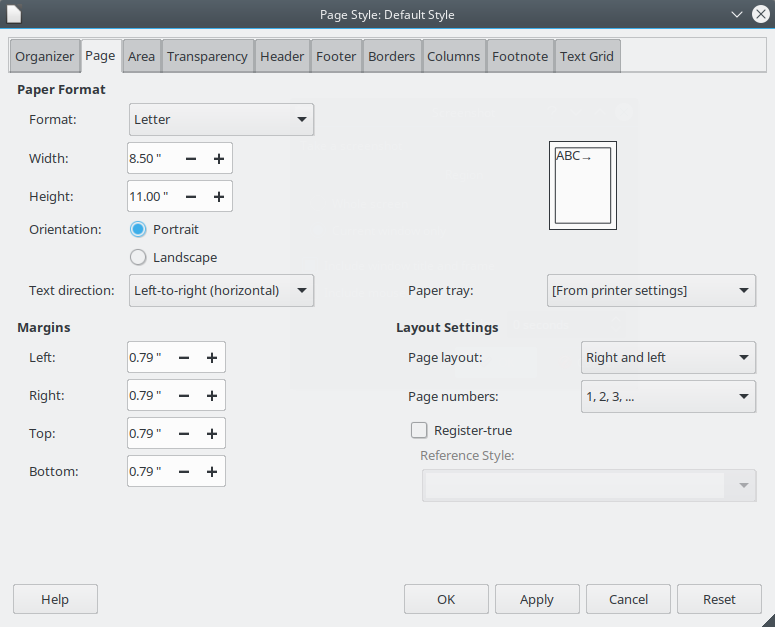 Page margins are defined by default at 0.79″ respectively 2cm on each side in LibreOffice Writer (located under Format > Page). These default values are under close scrutiny now. The survey will take only a few minutes and help us to make LibreOffice even better. Of course we are interested in your ideas. So please feel free to comment. I second Nicholas’ sentiment. In the survey I noted that this should be based on locale if possible, or asked at first-run/installation. Of course the default is what most users use. That is the problem with defaults. And why they should be good. And why it should be decided with the help of a competent designer, not a survey. — from a page to the others. I always change page margins whenever I design a new template. And the values I set are not in the proposed list (and cannot be because of the above). Which locale are you running in as its A4 for me by default. Country specific defaults would be great. If you are in an A4 / metric area they appear and if you are in a Letter / inches area that would be what shows. Could be a simple setup toggle. Unfortunately from what i can see, many of the icons in the Office 2013 icon theme are stolen directly from Office 2013, so these couldnt be added to a regular install. Yes. Default settings are of great importance. User habits are changing. More and more documents are consumed online, so the default margins may decrease to reveal more content on a page (i.e. on a screen displaying the page). I just missed the survey, so my suggestion is the default margins to be 0,5″ around in inch regions and 12 mm around in metric regions. After a while a user gets seasoned and gets using styles. Then she/he may influence the default page margins as well.